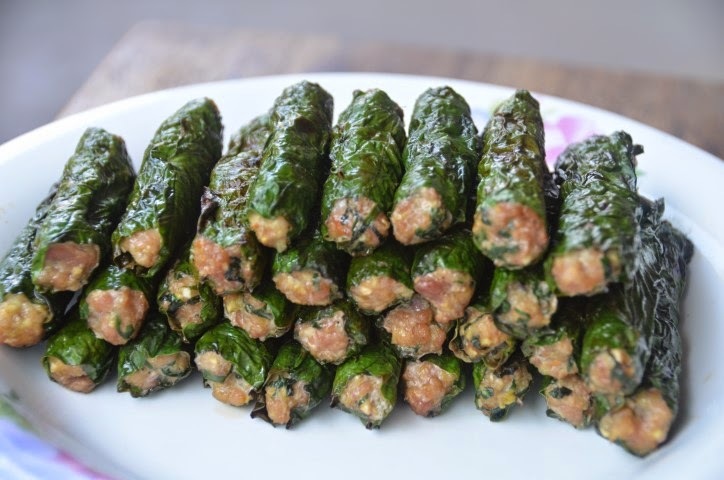 Recently I made Bo Nuong La Lot (Grilled Beef Wrapped in Wild Betel Leaf) with a few pork rolls. I did not get to taste the pork rolls then but Ah Ma (my grandmother) said they were tasty and ate 6 of the 7 rolls! One of my aunts ate the 7th roll and also said it was good. After my first attempt I came up with a few improvements for the second time around. These leaves are thin and burn easily if the grill heat gets too high. I realized if the meat comes to the edges of the roll and the heat is low then it will not burn during grilling. People generally use beef instead of pork with these particular leaves. However, my relatives and I can say we enjoy the pork version. Here are my improved rolls. My grandmother, uncle and aunt tell me these are good to eat without any special dipping sauce. 1) Stack the 25 young leaves, fold in half and chiffonade. Saute in about 1 tsp of oil for about 15-20 seconds or until the leaves are just wilted. Remove from heat and set aside. 2) In a meat grinder place the pork, lemongrass, shallot, garlic, ginger, turmeric, salt, sugar, and oyster sauce inside. Pulse a few times until the meat is just grounded and all ingredients are blended. Avoid over grinding. 3) Remove and stir in the wilted young leaves. Use a chopstick or fork and mix everything until well blended. Avoid over mixing. 4) Portion the meat out to 30 pieces and gently shape each piece into a thin log (the same length as the widest part of the leaf). 5) With the shiny side of the leaf facing down, add the meat (log) closer to the tip. Make sure the log is the same length as the widest part of that leaf. Gently roll the leaf with the meat up towards the stem. Use a toothpick or skewer and poke a hole at the end (in the middle of the roll) and put the stem inside to hold the roll in place. The meat should come to both edges of each roll. 6) Repeat until you have complete all the rolls. 7) Oil the grill (I use a clean paper towel) if needed. Place the rolls on the grill over low heat (as the leaves will burn easily). Turn the rolls to prevent them from burning. Grill these for about 15 minutes (depending on your grill and heat) or until they are cooked. *Be sure to save about 1/4" of the stem to help secure the roll together. If you have any with missing stems it is still fine to use. When you grill the roll just make sure you place the final end of the leaf facing down so the roll does not unravel during grilling. Once the leaf starts to wilt a little then the leaf will stick to the meat better. *I have never heard of or seen anyone putting chopped or chiffonade young and tender leaves mixed in with the meat but I think these add depth, flavor and texture to the rolls. My grandmother seems to like them very much so if these are good enough for her then they are good for me. *If you purchase your wild betel leaves they may be older and thicker. If you find them to be too thick to roll then you may blanch them quickly. I did not realized this until one of our visitors from Saigon told me this. Since I harvested my own leaves I can easily choose the young ones. She also tells me people do not put in turmeric. However, I added this because I have some in my kitchen and I was curious to see how it tastes. It turns out I like the extra added flavor. Be careful using turmeric since it can stain your skin and clothes. *I did not sprinkle chopped roasted peanuts over these rolls as they are too hard for my grandmother. If you prefer them this way then you may certainly add them. *I made Mam Nem Nuoc Cham--my cousin's way but added a little grated ginger and some lime juice as suggested by my mother and it turned out quite tasty. 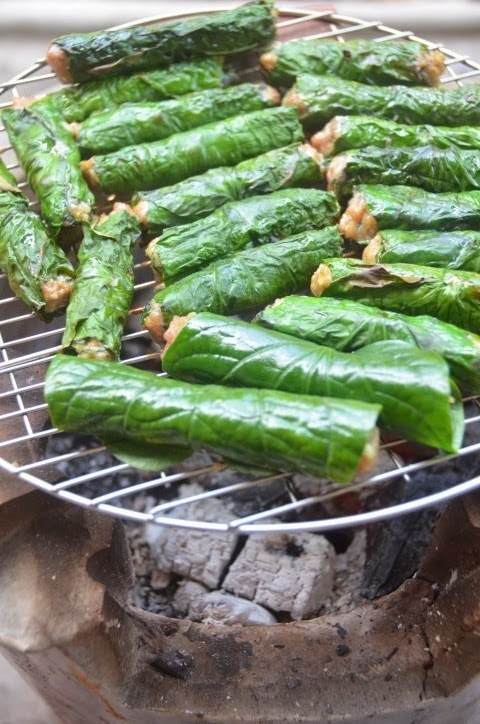 Please see Bo Nuong La Lot (Grilled Beef Wrapped in Wild Betel Leaf) for the recipe.